La version Française de VPlauncher a été interrompue. Cependant vous pouvez trouver une ancienne version Française ici. VPLauncher has been discontinued. There will be no new versions in the future. If this doesn't alienate you, read on. The old version can still be used. VPLauncher manages your collection of Visual Pinball and Future Pinball tables. It has data bases of tables and shows for every (known) table information like author, version, type of table etc. 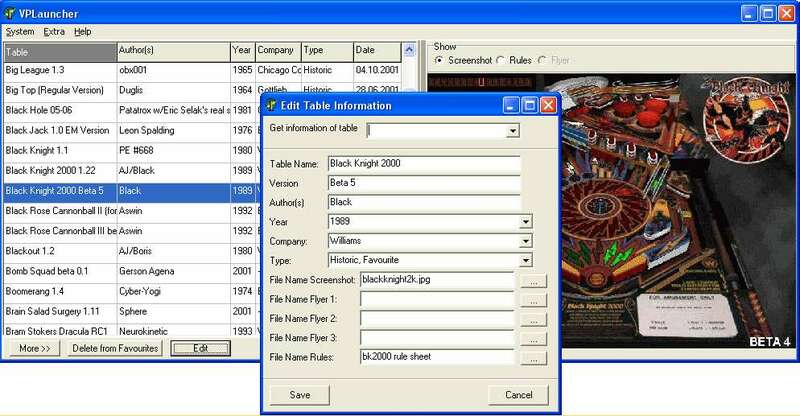 If a table is selected, a screenshot, the table rules and flyers are displayed (if available). A double click starts the desired table. For every selected table, a screenshot, the rules and flyers are displayed (if available). The size of a screenshot can be changed. Tables are grouped (like Historic, Original, VPinMame etc). You can select which types are shown. VPLauncher Visual Pinball data base contains table information for more than 2000 tables and almost 6000 versions. The Future Pinball data base contains table information for more than 70 tables and more than 100 versions. To find a table in the data base, the table file is matched against a checksum (CRC32). If the table file couldn't be found, the file name is matched against a file search name to identify the table without the version. Table information can be changed and information about new tables can easily be added. VPLauncher can display, if newer versions of your tables are available. VPLauncher can check your VPinMame ROMs. You can do your own screenshots with VPLauncher. You can rate tables and optionally send your ratings to me, so I can compile web pages from them (available at VPLauncher Table Ratings). You need to download VPLauncher installation file. Install VPLauncher to a directory of your choice by starting the self- extracting archive. Optionally, you can download and install the screenshot installation file and all available screenshots update files (see below). Install the screenshot files in chronological order. You also can download and install the optional Flyers and Rules pack. When VPLauncher is started the first time, the configuration dialog appears. Press F1 to get online help. Just delete the VPLauncher installation directory with all of its content. updated Visual Pinball data base (VPLauncher.dat, zipped (161kb)) 06/02/06 for use with other frontends like VP-Man as well. Future Pinball data base (VPLauncher.FPdat, zipped (4kb)) 02/10/06, maybe usefull for other frontends as well.